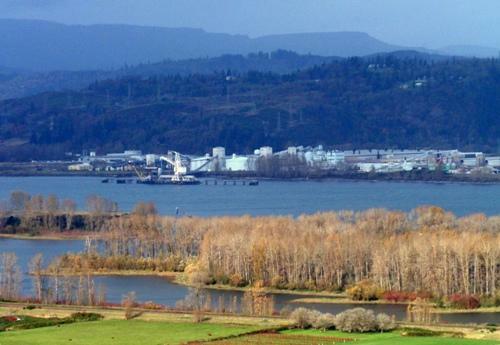 The coal export terminal would utilize the former Reynolds Aluminum smelter property in Longview, WA. Plans for a coal export terminal on the Columbia River at Longview are coming under fire from environmental groups. Many of them showed up at a Cowlitz County commission hearing on Tuesday. Ambre Energy North America would send coal mined in Wyoming and Montana by train to a renovated terminal. Company CEO Jeff Torkington says Longview offers an ideal site to then export the coal by ship to Asia. But environmentalists are appalled that the Northwest could become what they call “a gateway for coal to China.” Jessie Dye does outreach for the group Earth Ministry. The Cowlitz County planning staff recommended the Board of Commissioners approve a shoreline permit, which could happen next week. Ambre Energy needs several other permits before it can open.